Color Agent is a one part, air-drying, semi-paste ink commonly used for printing on hard surfaces including circuit board base materials. Color Agent contains petroleum distillates but is not considered hazardous and does not require special labeling. 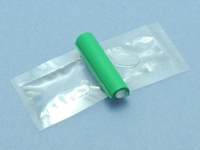 It can be used to tint the color of epoxy used for solder mask repair or circuit base board repair. Storage: Store between 40°F and 115°F. Chemical Composition: Monomers/Oligomers. The components of this product are not considered to be hazardous as defined by the OSHA Hazard Communication Standard 29 CFR 1910.1200. This product contains petroleum distillates which are exempt from special labeling by OSHA. This epoxy is clear and blends with color agent. Is supplied in pre-measured two-compartment plastic packages.